AppDynamics Lite can be configured to recognize the NeoLoad transactions. 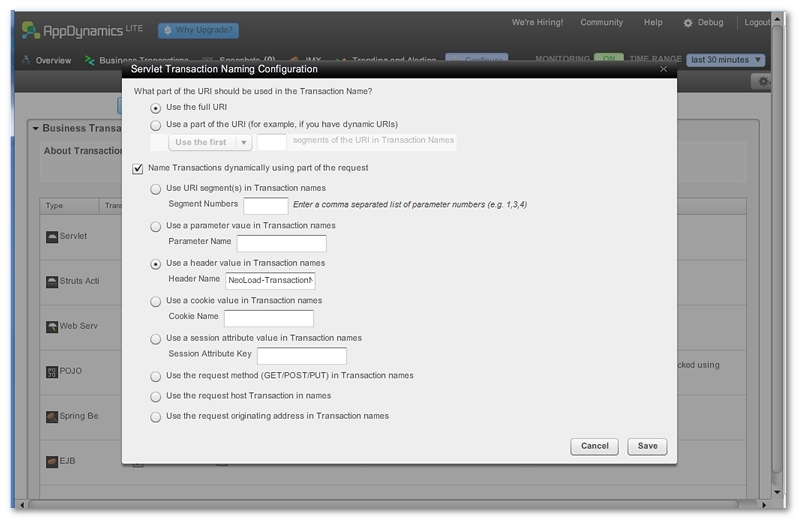 In AppDynamics Lite, the Configure menu gives access to the Transaction Detection tab. In the Business Transaction Identification Configuration list, the Servlet transaction type must be selected and set to Enabled. When the option Discover Transactions automatically for all Servlet requests, and name them by their URI is selected, a click on the Configure Naming command makes it possible to define the NeoLoad naming convention. Use the full URI or Use a part of the URI can be selected. Name Transactions dynamically using part of the request must be selected. Use a header value in Transaction names must be selected. Header Name is the label of the NeoLoad naming system: "NeoLoad-TransactionName". Clicking on the Save button validates the naming parameters. When a test is started in NeoLoad, AppDynamics is able to display the transactions in its Business Transactions list, as described in Read NeoLoad information in AppDynamics. 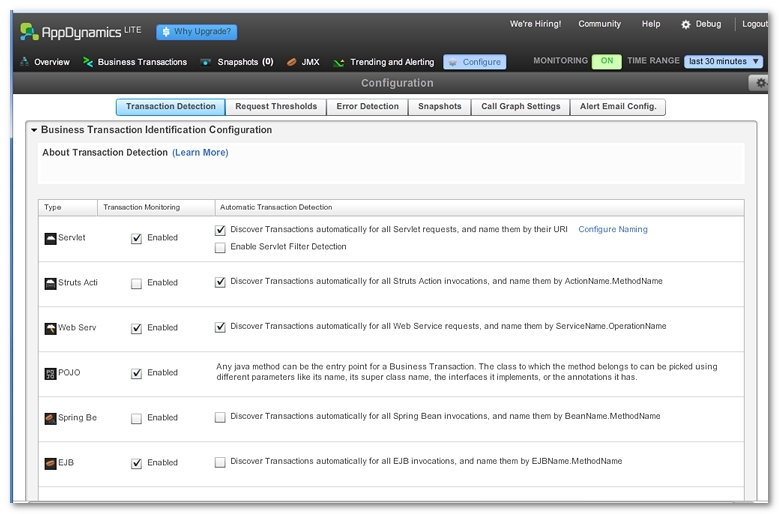 In AppDynamics Lite, click Configure > Transaction Detection. In the Servlet transaction type, select Enabled and Discover Transactions automatically for all Servlet requests, and name them by their URI. Select Use the full URI or Use a part of the URI. Select Use a header value in Transaction names. In Header Name, enter "NeoLoad-TransactionName".